To keep up with the rapid changes in technology, your business needs to hire smart, tech-savvy employees—and, thanks to the industry-wide talent gap, that’s getting harder and harder to do. Even with tech-savvy Millennials entering the workforce, we’re still facing a shortfall of qualified candidates and an incredibly competitive market. We know it can be challenging to find the employees and specialized talent you need. Filling that talent gap and finding the best employees for your business take time, effort, and strategy. One way to bridge the talent gap is by finding new kinds of employees to fill positions. Many tech companies are looking at non-traditional sources of qualified workers and are hiring more people with non-technical backgrounds, education, and experience. Companies in the United States are taking on workers from programs like the White House’s TechHire Initiative, President Obama’s program to retrain workers for in-demand tech jobs. TechHire launched in March 2015, and in just one year, one city’s TechHire has placed 135 graduates in full-time positions. On a personal note, I’m proud that Microsoft is helping lead the charge on retraining military veterans for technology careers. The Microsoft Software & Systems Academy (MSSA) provides tech training to current and former service members, helping provide a clear path to a great career in our industry. For example, Rachel Woolley was an Army medic who was able to take MSSA courses while still enlisted. After she left the military, she joined Microsoft as a service engineer with the SharePoint Online team. Her analytical thinking and problem-solving skills have served her well in both careers, and we’re lucky to have her. It isn’t just companies in the US that are suffering from a lack of skilled candidates: Australia is looking at a forecast of 100,000 new tech jobs by 2020, with not enough workers to fill them, and there are calls for programs to include more tech education earlier in schools and increase on-the-job training for employees who may not have traditional degrees. In South Africa, a recent survey found that the lack of skilled tech candidates was “the single biggest issue impacting on business growth” in capital Cape Town. The city’s CapaCiTi initiative is hard at work, training young adults for a future in the tech industry and placing them with recruiters who match them with employers. Tech companies have traditionally been reluctant to hire people who don’t have computer science degrees or a history in the industry. However, as technology reaches farther into our lives and work, we need the unique views and ideas that non-conventional employees like Rachel can bring to the table. Partner up to share talent. You’re not alone in the struggle to fill empty seats. Many of your fellow partners are facing the same issue. Fortunately, you and your fellow partners don’t always need the same kinds of expertise at the same time—and that means you can share talent. Use collaboration platforms like Dynasource to help fill empty spots on project teams. These types of platforms are great resources, especially for filling short-term needs—use them to find available tech professionals with exactly the skills you’re looking for. If you’re a Microsoft partner and haven’t signed up already, check out Dynasource now to get a free first month’s membership. Once you know which package works best for you, sign up any time from now through the end of the year to get your full Dynasource membership at a discounted rate of up to 40 percent. And if you’re a registered member of the International Association of Microsoft Channel Partners (IAMCP), you’re eligible for special IAMCP Dynasource promotional pricing plans, averaging 40-50 percent discounts. Be sure to check out the members-only IAMCP community on Dynasource to collaborate and communicate with your peers. 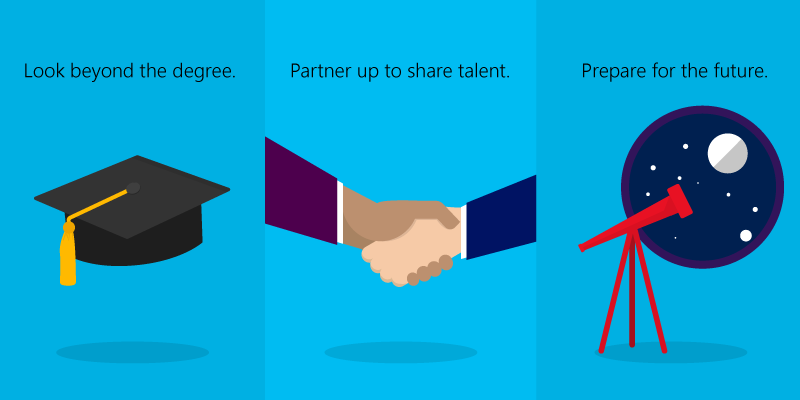 Another way to share talent is to tap into the Microsoft Alumni Association tech talent pool. There are over 6,000 Microsoft alums in our LinkedIn group for you to connect with. You can post openings here, join conversations, and find technology professionals with just the skills you’re looking for. The talent crunch may be happening now, but we also have to look ahead at the even bigger challenges we could face in the future. Some tech organizations are already preparing to fill talent gaps by pushing for greater computer science education in underprivileged communities. In India, for example, the India Stem Foundation encourages students to explore careers in technology through robotics and other hands-on learning experiences. Robotics competitions are a fun, engaging way for students to see what they can do with the right knowledge and inspiration. Programs like Microsoft’s Technology Education and Literacy in Schools (TEALS) are opening up access to computer science for students all across the United States. By pairing technology industry professionals with classroom educators to teach kids tech skills, we’re helping build the next generation of innovators, thinkers, tinkerers, and entrepreneurs. Black Girls CODE is a terrific organization that’s helping girls and women of color make space for themselves in an industry where they’ve been traditionally underrepresented. The tech talent crunch may not be as dire as predicted. I believe the pool of qualified candidates hasn’t shrunk, it’s simply changed, and we need to widen our vision to see that talent, vision, and innovation can come from many places. By sharing resources and thinking a little differently about what an “ideal” candidate looks like, we can not only fill the empty seats but invite new voices to the conversation and new faces to the table.